The last three days really have been exhausting and chaotic. Luckily I was organised earlier in the week and scheduled that last three blog posts to go live, otherwise I would have mysteriously disappeared for three days. Thursday evening I came down with the worst case of food poisoning, ever! I have never been so sick in my life. Sadly it was from a takeaway meal from one of my favorite thai restaurants, which means I wont ever be going back there again. I've never really suffered food poisoning before and I would never wish it on my worst enemy. What made it worse was that is was the opening game of my husbands baseball team on Thursday night. I had promised the kids I would take them to the game, they had treats and snacks all packed and we got to the game about 30 minutes before game time. I started feeling queasy on the drive to the ballpark, but once I was there everything came up. I'll spare you the rest of the details cause no one wants to hear and spewy and poopy pants story, but know that it wasn't pretty and lasted for 12 hours - although thankfully not as public as the scene from The Bridesmaids movie. Friday was spent recovering and Saturday I made it up to the kids and took them back to the ballpark for a double header. That was after Mr 5's T-Ball game in the morning and swimming lessons at lunchtime. On Friday night after the kids were in bed, I managed to pull together a mani in the baseball team colours. Not nearly as fancy as previous manis, but it was able all I could manage that night. I'm not sure if I can keep up this daily blogging over summer! Anyway, lets look at these quick nails. 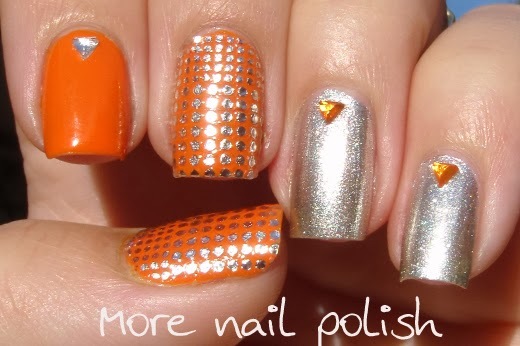 Polishes are Picture Polish Citrus and Orly Shine which orange and silver triangular rhinestones from the Born Pretty Store. 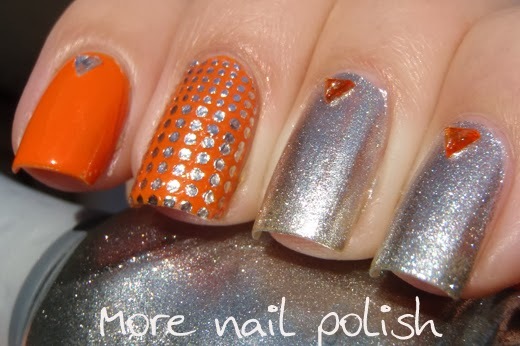 The middle finger and thumb both have a PERL brand nail strip, which is clear with embossed silver dots. I once had food poisoning from Woolworths Lasagna. Worst. Experience. Ever! Glad you are feeling better though :) I need to get myself some of those nail strips as they look fab as an accent nail! 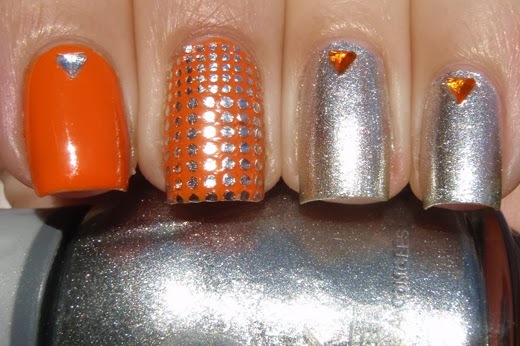 I wouldn't have thought of putting orange and silver together, but it looks great! Oh no, feel better! I've had my share of stomach woes lately so I feel your pain :( Get well soon! This looks great, I love the crazy sparkliness! Ugh, food poisoning is the worst!